“Fr. Kevin, how come the Mass is a little bit different during Lent?” That’s a great question – I’m glad you asked. During Lent, our personal and spiritual life should be geared towards getting us back to the basics of being a Christian. Our life should be stripped-down of excess – that’s why we fast during Lent. The Mass reflects that as well – it’s kinda stripped-down during Lent. The most obvious omission at Mass during Lent is that we don’t sing the ‘Alleluia’ before the Gospel. ‘Alleluia’ is what the angels sing as they’re gathered around God’s throne – it’s a term of great joy. Since the focus of Lent is on penance and sorrow for our sins, the Mass reflects this by omitting the Alleluia. The Gloria (Glory to God in the highest…) is also not prayed at Mass during Lent as it is also a song of praise and worship. 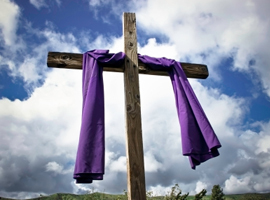 There are other symbols during Mass to signify that we’re in the season of Lent – the most noticeable being purple vestments (purple is the color for penance). The priest has the option of using Eucharistic Prayers (these are the prayers said during the consecration of the bread and wine into the Body and Blood of Christ) that have a penitential theme. In addition, we normally have 4 candles around the altar, but during Lent there’re only 2. Even the music is stripped down – when we recess out at the end of Mass we don’t sing, instead somber music is played. Calling all MQH men – if you’re looking for something spiritual to do during Lent, our MQH men’s retreat is this coming weekend, March 10-12. It’s at St. Anne Retreat Center in Melbourne (about 25 minutes from here). This year’s theme is ‘Unlocking Sacred Scripture in Daily Life’ and Fr. Nick Rottman, the pastor of IHM, is our retreat master. If you’re interested, please contact Steve Kidney (525-6562) for details. At the beginning of the school year, we started blocking off the Turfway entrance/exit with orange cones from 3-6pm. Traffic was cutting through our parking lot to avoid the stop light at Turfway and Donaldson and it was a major safety concern for our school students – especially our after-care students. Unfortunately, the orange cones didn’t work as I had hoped – some people would simply move the cones. So, our maintenance committee has installed a yellow chain at the bottom of the entrance to block access. So just a reminder, during school days the Turfway entrance/exit to our parking lot is closed from 3-6pm. Our school custodian, Lucius Jackson, is recovering very well from the serious back surgery he had in September. He pops in once in a while to say “Hey”. His rehab is going slowly but progressing very nicely – he hopes to be back on the job possibly by May or June. Please continue to keep him in your prayers. Come on out to our Fish Fry this Friday!!! Our special guest will be…….wait for it……… MR. REDLEGS!!! !- I can’t wait!!! Also, please volunteer to help with our Fish Fry – we have THE BEST Fish Fry around, but we can’t do it without your help!!! Sign-up online at http://signup.com/go/Y3hHMF or call Jenny at 525-6909.